Can Exercise Help Your Aging Adult's Brain Stay Strong? ← Does Your Diabetic Parent Have Gastroparesis? Can Exercise Help Your Aging Adult’s Brain Stay Strong? Home Care Services Atoka TN – Can Exercise Help Your Aging Adult’s Brain Stay Strong? When most people think about keeping their elderly family member’s brain strong and healthy, they don’t necessarily think about exercise first. But having a good exercise routine, especially with the blessing of your aging adult’s doctor, is one of the better ways to help her keep her brain healthy. 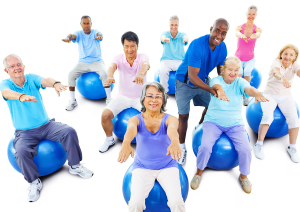 Aerobic exercise is exercise that gets your elderly family member’s blood moving all throughout her body. That means that it works not only your aging adult’s heart and lungs, but also her brain. As the blood flows through her body, your elderly family member might experience clearer thinking and a greater ability to solve problems that might have been difficult before the exercise. Exercises that test and improve your elderly family member’s motor skills, particularly eye-hand coordination, directly keep the brain engaged and working. These types of exercises are also a lot of fun, depending on what your aging adult enjoys. These activities don’t have to be complicated and they don’t need to last for hours to get great benefits. If your aging family member is fuzzy when she wakes up or if she gets into a mental slump in the afternoon, exercise can really help. A little bit of exercise in the morning can be just as effective as a cup of coffee. In the afternoon, a few minutes of exercise can leave your elderly family member feeling refreshed and ready to tackle whatever else is facing her for the rest of the day. Sometimes an elderly family member might find herself engaging in repetitive actions or behaviors that she doesn’t want to do, such as watching too much television or eating when she’s not hungry. Exercise can help to break those patterns, if your elderly family member catches herself doing what she doesn’t want to do. Instead of sitting down to watch TV, for example, she might take a walk around the block and then find something else to do when she’s done. Try involving home care services providers in your elderly family member’s daily activities. They can help to make sure that she gets a little bit of exercise every day, even if you’re not there to help her do so. This entry was posted in Exercise, Home Care Services Atoka TN and tagged Home Care Services Atoka TN. Bookmark the permalink.